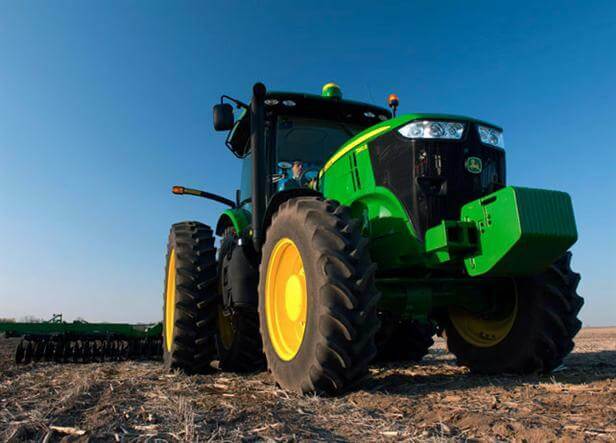 The John Deere 7R Series combines the versatility of a utility tractor with the power of a row-crop tractor. A new chassis that lets you ballast the tractor for hayfields or cornfields, while a longer wheelbase and shorter length gives you a power-dense tractor for improved maneuverability and stability. The new, refined Infinitely Variable Transmission (IVTT) helps you save fuel. The spacious CommandViewT II Cab offers the best in technology and comfort. Plus, the optional cab suspension system helps provide a super-smooth ride.